Mikimoto Pearls of Japan are the market leaders of Culturing Pearls. The Mikimoto company is dedicated to offering only the finest quality Cultured Pearls. In 1899, the first Mikimoto pearl shop opened in the fashionable Ginza district of Tokyo selling Natural seed pearls and half round pearls. The Mikimoto business expanded internationally, opening stores in London in 1913. The finest quality Mikimotos are the 'Hanadama Pearls' or 'Flower pearls.' Hanadama Akoya pearls are the finest Akoya pearls in the world. After every pearl harvest in Japan, the pearls are separated into graded lots to be sold direct to processing factories or at live auctions. Once a lot has been separated, the Hanadama Akoya pearls are selected from the harvest due to their remarkable luster, surface and overall quality. The MIKIMOTO sorting process and grading system assures every customer acquires only the finest quality cultured pearls available. The Mikimoto Pyramid represents the quantity and quality of all Cultured pearls harvested in Japan. Only those pearls at the top of the pyramid are considered worthy enough to carry the MIKIMOTO name. Exclusive pearl jewelry lines are distributed by MIKIMOTO. These lines are Blue Lagoon, Gordon’s Classic Collection, Sea Magic and Zales Signature Collection for Zales Jewelry. They should not be confused with MIKIMOTO brand pearls. Although they represent high- quality pearls at a good value, they do not meet the MIKIMOTO brand control standards. Mikimoto was 35 when he succeeded in culturing a round pearl in 1905 however the Early Discovery of the Cultivating Pearl Technique is a hotly contested subject. Mikimoto first opened a pearl accessory store in Tokyo's Ginza district and exhibited his pearls at the World Exhibition in Paris in 1937, winning global fame. Experts agreed; the only difference between a Cultured Pearl and a Natural Pearl was the artificial "nucleus" at its heart, but otherwise there was no difference in the structure. Thus, a globally recognized Japan Brand Pearl was born to the great delight of Mikimoto. In the history of Mikimoto, the following story is one of the most remarkable stories you will ever hear about the legend of Mikimoto who developed modern techniques for culturing pearls and then of convincing the public to accept them as valuable. One of the worst tricks you could play on a woman is telling her that the best way to clean Mikimoto pearls is to swish them through boiling water. As the pearls heat, they will lose their moonbeam lustre and will crack. Back in 1932, Japan honored a short, stocky, crinkly-faced old man who rolled up his kimono sleeves, seized a blunt spade and vigorously shoveled into a fiery furnace 720,000 of his best Mikimoto pearls. Within three minutes, all of Mr. Mikimoto's 720,000 highest quality pearls had turned to flaky ashes. Gathered around the furnace were Japan's leading pearl dealers. "Banzai!" they shouted. "May you live 10,000 years, oh Most Honorable Kokichi Mikimoto! Banzai! The price of pearls has risen!" The price had indeed risen by some 30% all because Kokichi Mikimoto had shoveled 720,000 pearls into a furnace. Unlike Brazilians who have burned coffee in the past to raise prices, Mr. Mikimoto had burned up nothing edible or useful and nothing that was not his own. Information on Pearls from Oct. 31, 1932, Time magazine, says that, from the fiery furnace, Mr. Mikimoto stepped back a unique hero of the Depression. It was not the Mikimoto pearls that mattered to him as much as the fact that what he had burned up was his lifelong dream. Oysters make both Natural Pearls and Mikimoto pearls. When Mother Nature annoys an oyster by allowing a tiny flea-bite of irritating substance to get under its shell, the oyster replies by covering it with a layer on layer of pearly nacre. The result is called an Oriental pearl or Natural pearl. When Mr. Mikimoto annoys the oysters in his 41,000 acres of oyster beds by having a minute substance delicately inserted in the body of each oyster, the oysters react by producing about $1,000,000 worth of pearls a year. In gratitude, Mr. Mikimoto erected a monument to the Mikimoto oysters. "Japanese culture pearls [Mikimoto]; produced by scientific stimulation of the oyster are in no sense false or imitation pearls. . .. 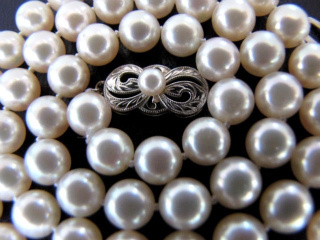 They can be sold as real pearls without any indication of their origin." Not only in Japan but around the world, Mikimoto, is the undisputed "Cultured Pearl King." He only spoke Japanese and was proud of his eccentricities and loved to entertain visitors to his pearl farm. Visitors to his farm were first served baskets of Mikimoto oysters. Next, Mikimoto disciples would open each of the guest's oysters, extract the pearls and present them to the guests. They would then throw the oyster meat and shells away. Mikimoto would then lea d the way to lunch which started with fried oysters in which the guests would find badly discolored pearls. Mr. Mikimoto always wore a Derby hat and a Japanese kimono which was symbolic. The Derby hat, (introduced in 1849 by William Bowler in England) when worn with a Japanese kimono, in Japanese culture means that the wearer has achieved a special rank, by his own achievements. British Expatriate and Australian Pearl Farmer, Mr. William Saville-Kent, might have achieved the recognition he deserved had he adopted a Derby hat and carried a boomerang. However eccentric Mr. Mikimoto the king of pearls might have been, he did achieve his dream. Mikimoto stamped his own name into Pearl History and onto the Clasps and findings of Mikimoto Cultured Pearls Jewelry.